This entry was posted on Tuesday, August 25th, 2015 at 9:57 am. SIX local people will be joining this year’s Motoscape Rally and driving nearly 1,000 miles in cheap old cars to raise money for Westbury Lions. Natasha Penny, owner of Busy Books accountants, will be driving one of three cars which will travel 991 miles from Saint-Omer in France to Venice in just five days. 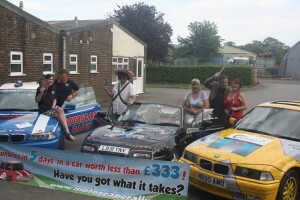 All cars in the challenge must be ‘bangers’ bought for under £333, and are decorated for the rally’s costume competition. This will be Natasha’s second year of entering the rally and she will be sharing driving duties with Matt Rowe, director of Westbury’s Hire Standards. Natasha said, “I’m really looking forward to the rally – I had such a brilliant time doing it last year I just had to do it again! “We’re raising money for Westbury Lions because it’s a great local cause; it’s a not-for-profit organisation and 100% of donations are put back into the community. Last year Natasha completed the rally in a 1994 Toyota Celica in the style of a Wacky Races character, which she later sold on eBay for £200. “I’m really looking forward to driving on the Nurburgring again,” she continued. “The BMW is a lot faster so it should be fun! It has a lot to live up to, though; last year’s car completed the entire journey to Prague without a hitch. Having raised over £1,300 for the RUH in last year’s effort, Natasha would like to reach £1,000 this year and has already received £600 so far. The Motoscape Rally is a banger rally started in 2005, which last year saw around 180 people drive across the continent in decorated old cars.